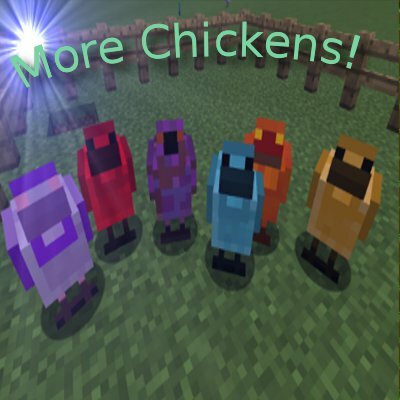 Could you add a few more chickens thats lays the new ingots from "Ender IO Endergy"? Like the Stellar Alloy Ingot for example. i see there is a chicken for alchemical brass ingot, but i cannot bred it, how do i get it?or do i need to ask this another Place? Its suppose to do it automatically, But sometimes if you add or remove mods with this mod. Than things can get out of order. Also you have to have a mod that adds brass and uses the correct brass ore dict name. If you think its messed up the file by editing it, or it regen before you added a mod with brass. Easiest thing to do is delete the config files for more chickens and let them regen. if i delete the config, that would not change anything for the chickens i already have? it wouldn't mess up your chickens, unless you have edited the chicken file your self already. If they are default chickens.. than you fine deleting it. With that said.. making backups are still a good idea. Is there going to be any Thaumcraft chickens added? I'd also like to see Thaumcraft chickens! Is there a simple fix in the config I can do? do these chickens work with uhh....vanilla ores?? Well there are issues with it not working correctly.. if your using the new alpha version I have, it should work properly, but I cant promise everything else will work properly. Just be warned configs will get overwritten in the alpha version. It gonna be cool if you add command that let ppl add new chickens. As a texture for chicken can be used texture of that material block (most of them surely have block versions). Are you ever going to expand on the mod support? It would be great if you were planning on adding other mods such as Natura, or on adding all of the other wood types in the game, like a spruce chicken or an Acacia chicken. Hi! Quick question, I have enderIO installed but everytime I add More Chickens, it never appears the options to get those chickens (not even in JEI). Try regenerating your chickens folder files. just delete the chickens folder in config and let it regen.